C. Jane Kendrick: Could This Be Considered A Book Review Post? Could This Be Considered A Book Review Post? Today we went to DI to buy some supplies for Ever's Halloween costume, just me and my boy. He found a blue robot in the dumpy toys section and insisted on having it for good. I like his track record of taking care of his robot collection. Most of them are treated pretty well, I'd almost say with skilled sophistication. And I've made a mental note that the only robots to survive the toy basket so far are the ones we've picked up from second hand stores and dumpster bins. Dumpster bins, that's daddy's business. 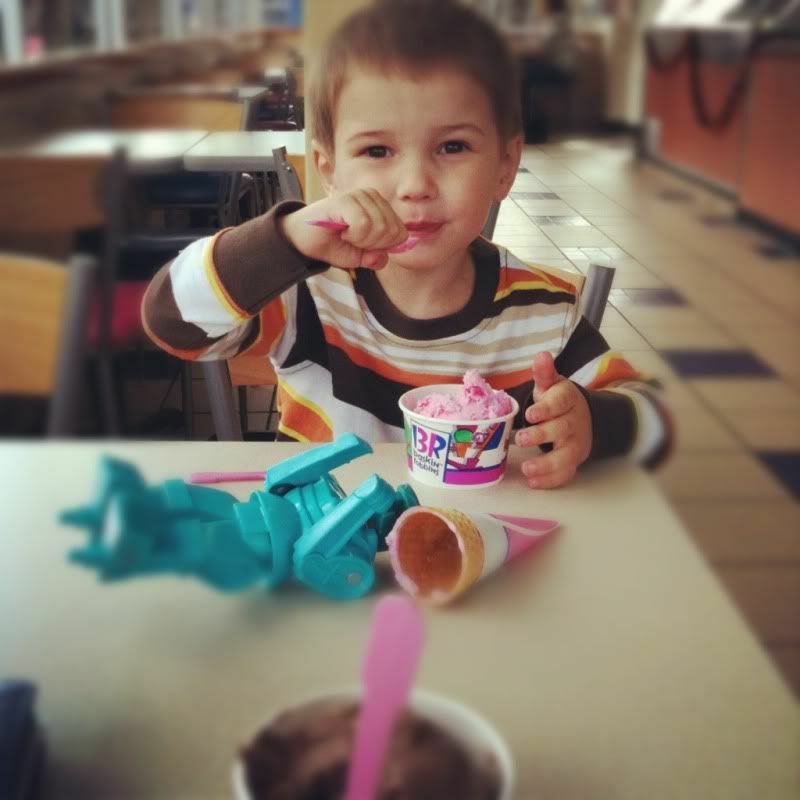 He was so cute and pleasant and the afternoon was so bright and brisk as we left the store, I decided on ice cream. Bubble Gum ice cream from Baskin Robbins. No, not for me. Mine was an enriching cup of peanut butter chocolate. If you are a BR fan, you know those are the only two flavors. Everything else is just sugar-coated churned fat in a tub. The thing is, my boy here, he's not my baby to be packed and played with anymore. He's sorta my dude. He's like a little buddy piece. We have conversations now. We laugh at the same jokes. He likes to massage my back. I like to wipe his bubble gum ice cream face with wet wipes. He made me read that soaking wet emotional toddler drama, "Love You Forever" before bed tonight. Ugh. I told Chup we're going to throw that one away (in the dumpster bin) because it makes me get teary as if I DON'T HAVE A CHOICE. That's sick manipulation, is what that book is. I don't really love it when the boy's mom has to call him to say, "Hello? I'm dying? Want to come over and hold me one last time?" because why wasn't the boy already aware? And then when he does show up she can't . . . finish . . . the lullaby . . . because . . . So help me, if this boy ever forgets me in my old age--after I bought him a lifetime of robots and bubble gum ice cream--I will haunt him from my grave. At the beginning of the week I got a request from my editor Aaron Shill from the Des News, "Will you write a column about why you don't like the term Mommy Blogger?" and I said I would. As I wrote it this morning I decided this was my last attempt at explaining why I don't like the term. It took me four hours to write that piece of editorial pie and meanwhile my kids were running around without pants. Just not worth the fight anymore. So let it be written, so let it be published. Oh, it was published. Here's the link. And now, I rest my case.